In an effort to help their teenage daughter Carson (Lara Vosburgh), a former straight-A student whose recent heroin addiction is destroying their family, Steve and Beth Morris (Christopher Parker and Colleen McGrann) contact the producers of Step Inside Recovery, a reality-based TV program that, if all goes well, will convince Carson to enter rehab and get her life back on track. The show’s host/producer, Suzanne (Kate Whitney), makes a bet with her two cameramen Tim (Brian Flaherty) and newcomer Jason (Morgan McClellan) that Carson’s drug problem is a direct result of her father’s alcoholism. But as they spend time with the Morris’s and witness Carson’s occasionally-violent outbursts, the trio becomes increasingly convinced that the teenager’s issues run much deeper than disharmony at home. In fact, if Carson herself is to be believed, she needs the heroin to keep an evil spirit that lives inside of her at bay! Eventually, Carson is taken to a rehab facility run by Dr. Prentiss (Richard Wilkinson), but her behavior grows more erratic as the drugs leave her system. Jason, who has developed feelings for Carson, comes to believe that the poor girl is, indeed, possessed by a demon, and, to help rid her of her unwanted guest, sets out to learn the reasons why she’s now host to a malevolent spirit. The question is: will he find the answers in time to save Carson, or will the devil inside of her win out in the end? 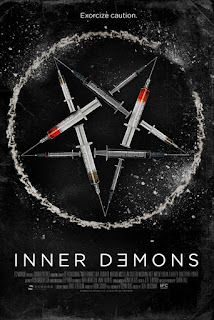 Much like The Taking of Deborah Logan (in which the lead character’s Alzheimer’s made her more susceptible to the influence of evil spirits), the creative minds behind 2014’s found-footage style horror film Inner Demons discovered an ingenious way to link drug addiction and demonic possession, with its lead character using heroin not for a personal high, but to suppress the monster inside of her. Later in the movie, when Carson is in rehab, we get to see just how powerful the demon truly is (there are eerie moments captured via surveillance video, though the truly effective scares occur when Carson is meeting with her support group). And while some of the film’s "horrific" sequences aren’t exactly fresh (we get yet another demon face-melting scene, a la The Exorcism of Emily Rose), Lara Vosburgh's excellent performance as Carson provides the audience with an emotional link to the story, and like Jason (also well-portrayed by Morgan McClellan) we root for Carson’s “recovery” every step of the way. As with its scare scenes, the third half of Inner Demons treads in familiar territory; the mystery as to how the demon found its way into Carson, as well as a few late revelations about her home life, felt a bit cliché. And while the television program provided a reasonable explanation for utilizing the found-footage style early on, we have no idea why the cameras continue to roll once events spiral out of control. But thanks to its clever storyline, plus a fine performance by Lara Vosburgh, Inner Demons is just good enough to make it worth your while.